New York City’s Bogen Productions is currently presenting the Toronto première of Pinter’s “Ashes to Ashes”. This show is exactly the kind of grain of wheat one hopes to find among all the chaff of the Fringe Festival. This grain, however, is of such high quality I could more easily have believed finding it at the du Maurier World Theatre Festival. If Beckett’s 1963 work “Play” can be seen as a kind of reduction and abstraction of Sartre’s “No Exit”, the same could be said for this short piece from 1996 in relation to Albee’s “Who’s Afraid of Virginia Woolf?” Not that there is any screaming and shouting or even a second couple in “Ashes”, but both plays involve gradually bringing to the surface the fact of a lost baby, in both the male figure acts as a kind of therapist for the female figure and in both the sort of conversation the couple has appears more like a kind of game. The amazing thing is that Pinter brings about much the same effect as in Albee’s play of growing horror but in the space only about 40 minutes with only two people, one of whom remains seated throughout. Unlike in Albee, the focus is political not personal since the woman has experienced some form of organized atrocity that has left her in an almost impenetrable daze. Since “Betrayal” in 1978, Pinter’s plays have, with one exception (“Moonlight” in 1994), become very short, almost abstract meditations on the nature of power. The subtext of menace and threat in his earlier plays surfaces now as the main subject so that the elliptical attempts at conversation the characters have are there primarily to outline the nature of this threat. “Ashes” begins in the middle of the story of what seems to be a wife, Rebecca, telling her husband, Devlin, about an affair she has had with an abusive lover. As Devlin presses her for more details, we find she cannot say (or won’t say) when or where she knew the man or even what he looked like. All she will say is that he was a kind of “guide”, who took her to a factory where the employees so adored him that he said he could easily lead them over a cliff singing if he wanted to. Later, she says she actually saw people being willingly led on a sunny day to drown themselves in the sea. This lover also seems to have been in charge of an incident when screaming babies were snatched from women about to board a train. The relative calmness with which these stories are told and received is chilling and gives a sense of unreality to the action. By the end we realize we don’t really know if Devlin and Rebecca are husband and wife or how much either one has said is true. When Devlin asks if they should “begin again” to which Rebecca says that she would rather “end again”, we have to wonder to what extent they are playing roles in a game for purposes we don’t understand. Is Devlin actually the lover who has so traumatized her that she can’t think of him and her husband as the same person? Or is Devlin so jealous of this past relationship of Rebecca’s that he drawn to imitate her lover’s abuses? These are only two of the innumerable questions that the play suggests. What does seem to be clear is that Rebecca is has been traumatized by a horrible loss and that Devlin’s reaction of jealousy rather than compassion to that loss is itself horrifying. The last words of the play were met with a long, dead silence as if we had a door had been opened on something so shocking that we couldn’t at once take it all in. Fiona Jones as Rebecca and Timothy Roselle as Devlin, both making their first appearance in Canada, handily gave the lie to the notion that Americans don’t know how to play Pinter. Their performances in firm British accents were superbly judged, with just the right pauses, glances and suppressed reactions to reinforce or undermine their speeches as necessary. Both were masters of timing and of suggesting the ambiguity of their characters’ motivations. Does Devlin ask his questions to help or harm? Does Rebecca say only what she can or want she chooses to? The director, Eric Fallen, born in Hamilton and now resident in New York, expertly guided the actors over the emotional and intellectual tightrope of this play. His and lighting designer David Alan Comstock's subtle work even made me wonder whether the characters’ names and the play’s title are an ironic allusion to Daphne Du Maurier’s famous gothic novel besides to the childrens’ song sung in the play. For this play does present a mystery--the mystery of how to live with a horror both within and without. 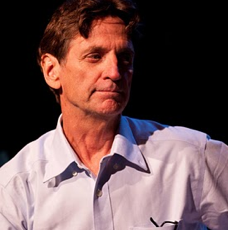 Photo: Timothy Roselle in War Crimes. ©2010 Karen Sieber.